NHS England is setting up lung cancer scanning trucks in supermarket car parks across the country in a drive to detect the disease earlier. The programme will invite people aged 55-74 who are at an increased risk of lung cancer, such as heavy smokers and ex-smokers, for a lung health check to assess lung cancer risk, and then a chest CT scan if needed. In a bid to boost early detection rates, the programme will be rolled out in 10 areas with the highest death rates from lung cancer. Officials hope the £70 million Targeted Lung Health Check scheme will reach 600,000 people over four years, detect 3,400 lung cancers and improve survival in tworst-hithit areas of England. Sara Hiom, Cancer Research UK’s director of early diagnosis, said the programme is “an important step forward”. 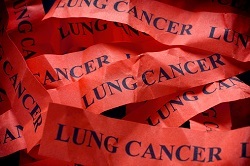 “Lung cancer is a devastating disease taking more than 35,000 lives every year. We hope this programme will provide valuable information and robust data about how low dose CT scans for people at increased risk of lung cancer will work in practice,” she said. Initial and as yet unpublished results from a large European study involving more than 15,000 people suggested lung screening with low radiation dose CT scans could reduce deaths from lung cancer by 26% in men by improving early detection rates. Until the results are published in full, it’s not clear how these benefits might be weighed against the risks of screening. In a recent pilot study for the car park scanner programme in Manchester, a total of 2,541 patients were scanned, with 65 lung cancers detected. Prior to the pilot study, just 18% of lung cancers were being diagnosed in the earliest stage of the disease in the area, but that figure rose to 68% after the study. The Manchester study also picked up several other serious heart and lung conditions, including chronic obstructive pulmonary disease (COPD). But as well as helping to spot some lung cancers earlier, scanning could also detect some cancers that wouldn’t have gone on to cause any harm. This is a key challenge with screening programmes and could lead to some people being treated who didn’t need to be. The CT scans also expose people to low levels of radiation, which could increase the risk of cancer developing in the future. The Targeted Lung Health Check programme forms part of the NHS long-term plan, which sets out the NHS’s ambition to diagnose three in four cancers at an early stage by 2028. Hiom said that it’s vital that the NHS has enough staff to do the scans and provide any necessary follow-up treatment. “This programme shouldn’t distract from efforts to boost NHS Stop Smoking Services and to diagnose patients earlier among those who don’t meet the criteria for targeted lung screening,” she added.